Travellers on today’s Volk’s Railway will be unaware that it originally ran on a high, flimsy-looking steel viaduct from the Pier terminus for several hundred metres eastward, well beyond Paston Place. Part of this viaduct was completely washed away in the same storm of 1896 that finally did for the old Chain Pier. The viaduct was reinstated, but shingle buildup since has been so great as to make the original elevated alignment now ground level, although I can remember that in my own childhood (1950s) the Pier terminus itself still stood on a metal structure with space underneath. 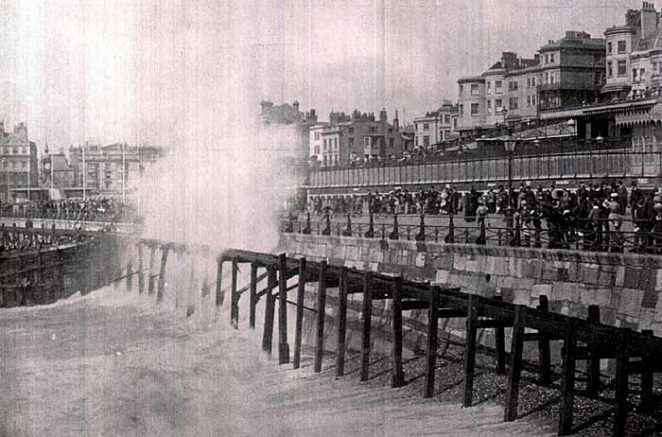 An excellent 1932 picture of the viaduct, at least five metres above the beach, with people happily bathing immediately below it, can be found on page 16 of “Volk’s Railways, Brighton: An Illustrated History” by Alan A Jackson (Plateway Press). The viaduct at Aquarium Station was originally made of wood but was rebuilt using steel during the early 1950s. There is still a viaduct there but it has been renewed several times since then. The viaduct shown on page 16 of Alan Jackson’s book is located just east of the Banjo Groyne, not at Aquarium. Longshore drift over many decades has resulted in it being completely buried by shingle. The remains are probably there to this day. For a comparison, see page 19 of the book. A small, rusty and broken part of one of the top girders is still visible to the north of the railway track.